Take note, this is a Part 2 episode, so for the best listening experience, listen to episode 201 first. Assuming you have listened to episode 201, then you already know our guest, Brad (‘Darb24’ in the chatroom) is an absolute beast who will do whatever it takes to get to where he wants to go. He’s truly a shining example of someone who pulls out the hardhat instead of the victim card when things get tough. In Part 2 we now move more into his actual trading and the way he is approaching the markets to pull the most profit as possible while keeping his risk minimized. If you enjoyed Part 1 there is no doubt you’ll enjoy Part 2, so let’s get to it! Now we pick it back up with Brad. He originally thought options were too complex of a product to trade but this all changed once he went through the Options Trading Simplified course. Unfortunately he had to spend some time finding a broker with reasonable commissions. 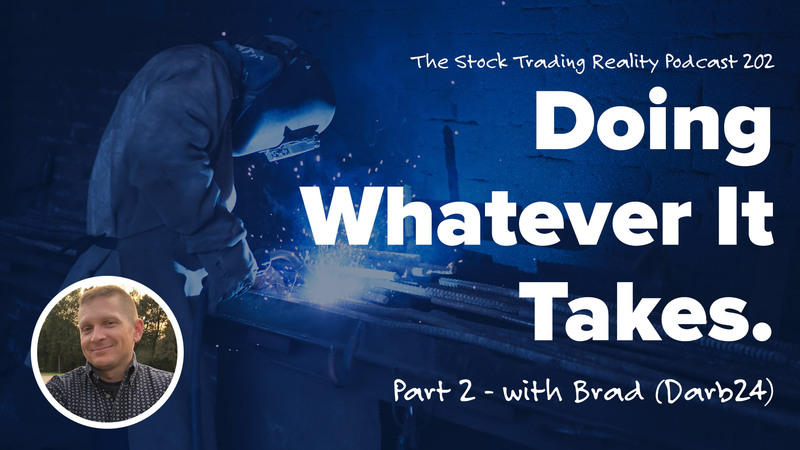 Brad decided to go with Tastyworks because of the lower commissions but the platform is not the best for day trading. He also experienced ‘the voices’ that come out when he starts to run out of buying power and has to sit out the rest of the day. While Brad admits to being breakeven at this point in his trading, that is the first step to profits. A big difference between Brad and other traders is that he is focusing on his consistency much more than the size of his profits. This is crucial for long term development. Taking it small, trying to form the good habits and working on breaking the bad ones. With me trading such a small account, it doesn’t take very long to go through my buying power. If I start off the day with a loss I start off the day with a loss. It is what it is. Once I do get gains on the board it gets me to thinking about taking the risk of giving them back.